Learning Spanish is a great way to learn the culture. It also gives you the opportunity to meet and communicate with various types of people. However, like most foreign languages there are terms that often confuse learners. Ser and estar are two examples. 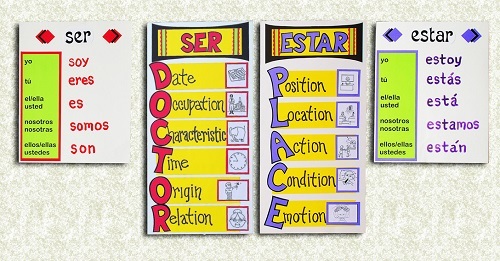 The Spanish terms ser and estar both mean “to be,” but they are used in different ways. Describe people using names, physical qualities, or nationalities. Talk about how someone makes a living or how someone spends his or her time. You may have heard the oversimplification that “ser” is used when talking about things that are permanent while “estar” is used when referring to things that are temporary. However, this generalization can lead to mistakes, especially since there will be many exceptions if you follow it as a rule. Wendi Garcia. "Difference between Ser and Estar." DifferenceBetween.net. February 19, 2018 < http://www.differencebetween.net/language/difference-between-ser-and-estar/ >. Hilder, R. “The Ser vs. Estar Question: To Be or to Be?” Fluent U. Web. 5 Jan. 18. “Ser vs Estar: The Definitive Guide to Spanish’s Most Testing Verbs.” Real Fast Spanish. Web. 5 Jan. 18. “Ser and Estar: Part I.” Study Spanish. Web. 5 Jan. 18.